VA Form 10-10EC or the "Application For Extended Care Services" is a form issued by the U.S. Department of Veterans Affairs. Download a PDF version of the VA Form 10-10EC down below or find it on the U.S. Department of Veterans Affairs Forms website. STEP 1. Before You Start. . . .
What is VA Form 10-10EC used for? directly by VA or paid for by VA.
Who should complete a VA Form 10-10EC? The following veterans will NOT BE REQUIRED to complete VA Form 10-10EC or pay Extended Care Copayments. A veteran receiving extended care services related to certain care or services for cancer of the head or neck as authorized under 38 U. An eligible combat veteran receiving extended care services related to treatment authorized under 38 U.S.C. 1710(e)(1)(D). day health care, non-institutional respite care, and non-institutional geriatric care. A veteran receiving care for psychosis or a mental illness other than psychosis pursuant to 38 CFR 17.109.
needed to complete VA Form 10-10EC. What will I need to know in order to complete the form? All health insurance information covering you even if it is through your spouse (a copy of your insurance card). Medicare information (Part A & Part B) (a copy of your Medicare card). Spousal/Dependent information (including spouse's social security number, dependents date of birth). Section I - General Information. Include your name and full social security number. Medicare card and all health insurance cards and include them with this completed application. eligible for benefits) (38 U.S.C. 103(c)). extended care copayment amount when a veteran reaches 181 days or more of institutional (inpatient) extended care services. EXISTING STOCK OF VA FORM 10-10EC, MAY 2005, WILL NOT BE USED. Section V - Liquid Assets. Do not report liquid assets if the veteran is receiving only non-institutional extended care services. coin collections, art work, and other collectibles. more of institutional (inpatient) extended care services. Section VI - Current Gross Income of Veteran and Spouse. Do not include income from dependents. Report net income from farm, ranch, property or business. distributions from Individual Retirement Accounts (IRAs) or annuities. Include any educational expense incurred by the veteran, spouse or dependent. arrangements for yourself, spouse, or dependent. Include rent or mortgage payment for primary residence only. monthly expenses during the past year for your utilities. Include car payment for one vehicle only. Include amount spent for food for veteran, spouse or dependent. eyeglasses, Medicare, medical insurance premiums, medical copayments and other hospital or nursing home expense. Include insurance premiums such as automobile and homeowners. Exclude life insurance premiums. Include taxes paid on property and average monthly expense for taxes paid on income over the past 12 months. Privacy Act and Paperwork Reduction Act Information. 2. In Section VIII and Section IX, you or an individual to whom you have delegated your Power of Attorney must sign and date. 4. Return the original form and supporting documentation to the Social Work staff at your local VA medical facility. 3. ARE YOU ELIGIBLE FOR MEDICAID? top of page 2, read, sign and date. EXISTING STOCK OF VA FORM 10-10EC, MAY 2005, WILL BE USED. services and agree to pay the applicable VA copayment as required by law. retirement accounts, stocks and bonds). institutional extended care services or spouse or dependent residing in the community. 2. Net income from your farm/ranch, property or business. interest, dividends) Refer to instructions. income over the past 12 months. authorize any such third party or administrative agency to disclose to the VA any information regarding my claim. received a copy of the Privacy Act Statement and agrees to make appropriate copayments. 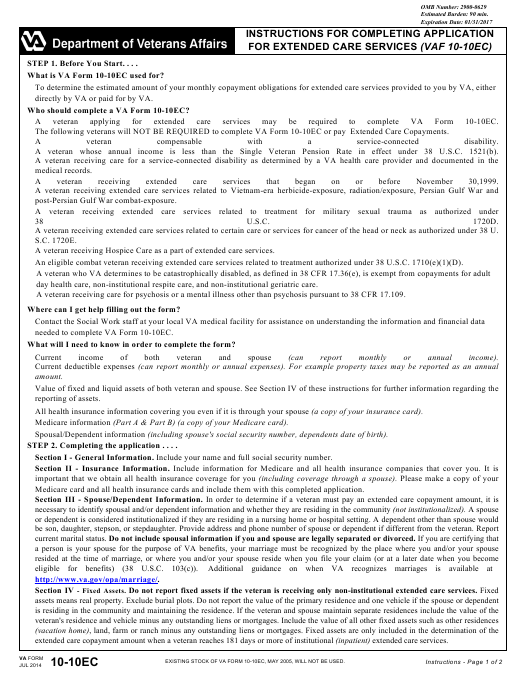 applicable copayment for extended care services as required by law. this information collection is in accordance with the clearance requirements of section 3507 of the Paperwork Reduction Act of 1995.